What a nice way to start the week but if you missed out on hearing that Anthony (The Duke) Duclair one of the New York Ranger's 3 third round picks from the 2013 NHL draft was named the "Telus First Start of the Week" on Monday. It is kind of funny as in my book "The Duke" was deserving of this honor on a couple other occasions but this works too. BOUCHERVILLE, Monday December 30, 2013 - Anthony Duclair, Matthew Boudens and Danick Martel were named today the TELUS three stars of the week for December 23 to 29, 2013. 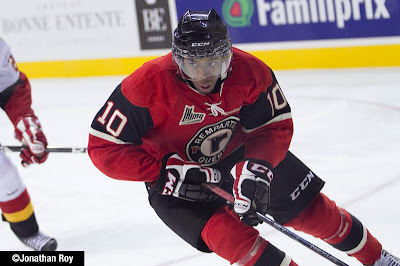 The first star of the week is awarded to Anthony Duclair, Quebec Remparts forward. In two games against Rimouski, Duclair scored 2 goals and added 4 assists. Saturday, he got 4 points in a 5-4 overtime win. Sunday, Anthony scored the tying goal to force overtime but the Remparts eventually lost 3-2. In 37 games this season, Duclair has collected 57 points. Matthew Boudens of the Drummondville Voltigeurs is the second star of the week. The Voltigeurs got 2 wins against the Sherbrooke Phoenix this weekend. Boudens contributed with 5 points, 3 of them goals. In 38 games this season, Boudens has averaged almost a point per game with a total of 36. The third star is the Blainville-Boisbriand Armada forward, Danick Martel. In two games against the Gatineau Olympiques, Martel made 2 goals and added 3 assists while maintaining a +/- of +3. In Sunday's win, Martel scored 2 goals and added 2 assists on top of being named first star of the game. In 38 games he has collected 42 points this season. It is going to be fun watching the WHL's Eastern Conference in the 2nd half as there are 3 teams with Islander and Ranger prospects fighting it out for a playoff spot. The problem is that none of the teams teams are playing like they really want the spot as none of them can put together a consistent effort to run off some wins. Mackenzie Skapski (NYR 2013 6th) was weak on Friday getting yanked after 40 minutes, was "lights out fantastic" on Saturday but on Monday was back to playing weak. Nobody has been the model of inconsistency than Skapski. It is a shame too because when Skapski has his game then he is as good as anyone. But when Skapski is not then games like the 4-1 loss to the Calgary Hitmen are the norm. Skapski played the entire 60 minutes giving up 4 goals on 40 shots. But the blame should not be placed only on Skapski's shoulders as 3 of those goals came in the 3rd period when the Hitmen turned the game into a practice shoot around. The Hitmen fired 24 shots at Skapski who by then was playing in his 3rd game in 4 nights. No support and you get results like this as Skapski is 10-11-2-1, 2.91 goals against and a 0.910 save percentage. Kyle Burroughs (NYI 2013 7th) and his Regina Pats are not much better as they were shut out on Friday, came back to win on Saturday only to be shut out again on Monday. Monday night it was Burroughs's Regina Pats hosting the Prince Albert Raiders and they were great hosts playing a sloppy game that in the 3rd period led to 3 Raider goals for their victory. Ryan Pulock (NYI 2013 1st) and his Brandon Wheat Kings were the only one of the trio to win 2 games this weekend. The Wheat Kings jumped on the Red Deer Rebels for 3 first period goals and then hung on for a 4-3 win. Pulock scored his 12th goal of the season as part of Brandon's first period attack. Pulock was named the game's "1st star" improved to 12-18-30 on the season which is also the tops among Islander prospects. Pavel Buchnevich (NYR 2013 3rd) and his Russia teammates just might have been looking right past the team from Finland but if they did then they got their just desserts. Buchnevich had an assist for his 4th point in 3 games but his Russian team were upset by Ville Pokka (NYI 2012 2nd) and Finland 4-1. Pokka has 2 assists in 3 games in this season's tournament. Adam Pelech (NYI 2012 3rd) and Team Canada were also guilty of looking past Slovakia and their game with Team USA allowing Slovakia to hold a 3-2 lead going into the 3rd period. However Nic Petan of the Portland Winterhawks AKA "The Evil Empire" scored twice in the game's last 2:40 to rescue Canada from a second embarrassing overtime for a 5-3 win. Pelech was scoreless while Pokka earned his 2nd assist of the games.